The gods have smiled upon Santa Barbara. Its location, by the Pacific Ocean, is a delight. Its climate is temperate. Its architecture, with no high rise buildings, is wonderfully attractive and much of it has deliberate references to the style of the 18th century Spanish missions. Its facilities, such as the charming art gallery, are of high quality. Its long main thoroughfare, State Street, is pristine and sparkling and its many shops draw customers from far and wide. It is no wonder that the good burghers of Santa Barbara are so proud of their town. Such pride is entirely justified – and it extends to the town’s excellent hotels and restaurants. Having visited some of them, I am beginning to share that same enthusiasm. Let me concede at once that the Hotel Santa Barbara is not the haven of unalloyed luxury in which your correspondent usually lays his head. Yet I am keen to recommend it to you for several reasons. Chief among them is its location. I have mentioned State Street. 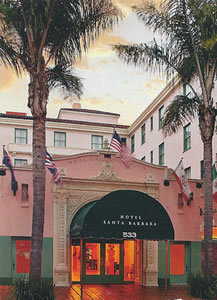 The Hotel Santa Barbara is actually on State Street, right where you want to be. Once a week, there is a famous farmers’ market in the town. Where is it? Right outside the main entrance to the hotel – so that I only had to wander a few steps to find a stall selling the most delicious honey at bargain prices. Then there is the building itself (pictured). In 1925 an earthquake destroyed much of the downtown area. The current structure dates from the following year. Apart from being elegant, as you can see, it is also capable of movement – for, amazingly, it rests on rollers – thus guarding it against all but the most severe tremors. Hollywood stars, like Clark Gable and Carol Lombard, used to stay here, when they needed a rest from their filming. The place eventually became a bit dilapidated, but restorations in the 1970s and more recently have brought back its charm. And, most important in a town with so many visitors, it has its own parking – hidden out of sight in the rear and efficiently operated by youthful valets. My own gas guzzler safely stowed away by one of these young fellows, I walked through to the spacious lobby (pictured) and then took the quaintly old-fashioned lift to the 4th (and top) floor. 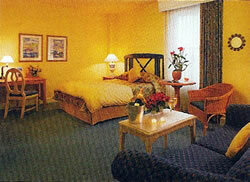 Here was my air-conditioned billet, a King Room ($149-$269 a night for two, including breakfast, according to season). The picture will communicate to you its traditional charms: the colour scheme was blue and yellow, the armchairs were in wicker work, within the fitted wardrobe was a private safe and an iron and an ironing board and the lighting was provided by three table lamps and a standard lamp. The small, tiled bathroom was through a sliding door. I liked best the abundance of space in the bedroom and the very comfortable bed, which had been made particularly soft, at my request. Tamara Erickson, the General Manager, deserves credit for presiding over an establishment which is so evidently well-run. I was not taken with the paper cups for the coffee at the breakfast buffet, set out in the lobby each morning, but – even here – I found a new experience to like. Never before had I tasted a toasted bagel. I can report that, as long as it is smothered in butter, it is a handsome beast. 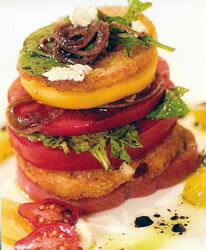 Talking of tasty food brings me to Mitchell Sjerven. Mr Sjerven is a restaurateur who has given to Santa Barbara two well-regarded dining rooms. 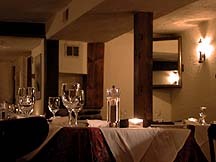 I tried them both, for they are both within easy walking distance of the Hotel Santa Barbara – and, indeed, the hotel offers special deals which include dinner in these restaurants. ‘Bouchon’ is, of course, the French word for wine cork. Mr Sjerven is an enthusiast for the wines of Santa Barbara County. Virtually all the bottles on the list are therefore from California’s Central Coast, from Monterey in the north to Ojai, just south of Santa Barbara. 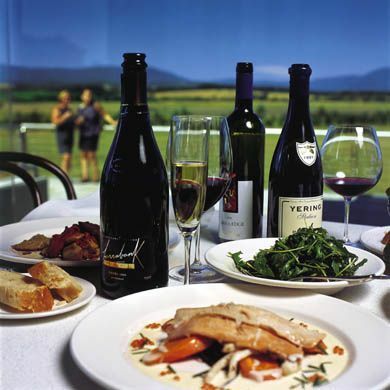 There are 200 offerings and around 40 wines are available by the glass. This makes for an interesting experience. I found the late harvest pinot blanc (Costa de Oro, Bien Nacido, 2005 - $11.50, glass) sufficiently luscious for the foie gras, although it lacked a balancing acidity. My pinot noir was good: earthy, solid, alcoholic, full of red fruit and with lots of residual sweetness (Foxen, Bien Nacido, Santa Maria, 2006 - $105). 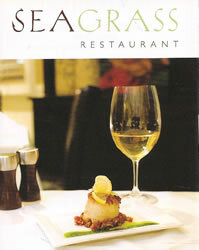 Sea Grass is Mr Sjerven’s more recent venture, and I found his charming wife, Amy Sjerven, presiding over its sophisticated, softly-lit dining room. This was a place very much to my taste. I liked its white shutters, its brown leather armchairs, its white damask napery and (again) its Riedel glassware. 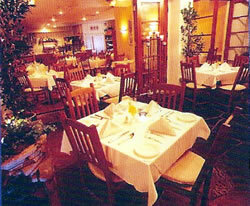 Chef Josh Brown says that he has “taken care with the menu not to overwhelm the palate with spice or heat”. I say three cheers to that. Fish is the emphasis here, with serious efforts being made to ensure that it is both fresh and from sustainable sources. Here the wine list is less emphatically local. From its 100 or so offerings, I had a glass of Austrian grüner veltliner, typically full of melon and lychees (Kamptal, Summerer Langenlois, 2006 - $13.50), and another lovely pinot noir – this time hot, spicy and oozing with black cherries (Tantara, a Colline, Arroya Grande Valey, 2006 - $95). Yes, those gods continue to smile on this wonderful town. To be so blessed is a mighty privilege. But the inhabitants know that, which is why they welcome their visitors with such kindness and charm. As you might have gathered, I like Santa Barbara. 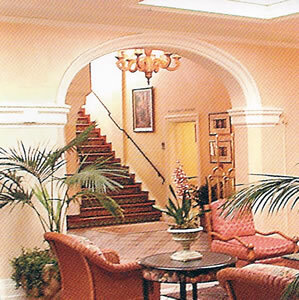 533 State Street, Santa Barbara, California 93101, U.S.A.
9 West Victoria Street, Santa Barbara, California 93101, US.A. 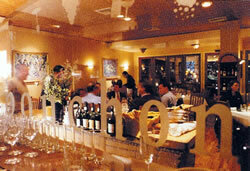 Open for dinner nightly from 5.30 p.m.
30 East Ortega Street, Santa Barbara, California 93101, U.S.A.